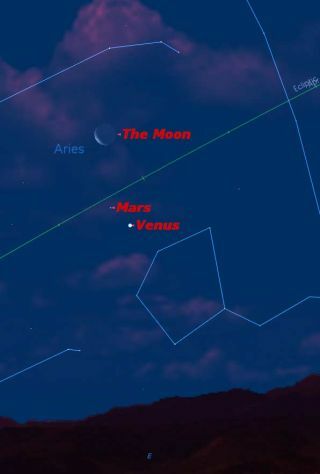 Just before dawn on Friday, June 19, there will be a pretty grouping of the crescent moon, Venus, and Mars. Updated June 18 to including timing (3rd paragraph). As the moon travels around its orbit once a month it passes close to all the planets. Such "close encounters" are called "conjunctions" in astronomical lingo. Though close together in the sky from our perspective on Earth, these objects are usually very far apart in space. This Friday morning, June 19, there will be a triple conjunction of the moon and the planets Venus and Mars. The event will be visible in the predawn sky. The best time to look is after 3 a.m. local time and before daybreak. The view will be slightly different, compared to the maps on this page, depending on where you live. Venus is the brightest thing in the night sky, other than the moon, so it is easy to spot. Mars, though close in the seemingly two-dimensional sky we can look up and enjoy, is much farther away in the third dimension -- distance -- as well as being farther from the sun's light, so is much fainter than Venus. Still, you should be able to see Mars just above and to the left of Venus using the accompanying maps. On Friday morning, this "double planet" is joined by the crescent moon, on its rapid monthly trip around the our world. Because of the tilt of the moon's orbit, its location varies, and on this occasion it will be quite a bit higher in the sky than Mars or Venus (six degrees above Mars and seven degrees above Venus). All three should just fit in the field of a small binocular (or with the naked eye, you can blot them all out with your fist on an outstretched arm). A software program like Starry Night lets us see what's really going on here by letting us view the solar system from a different perspective. A cosmic bird's-eye view shows us what this conjunction would look like as seen from a viewpoint high above the sun's north pole. The moon is so close to the Earth -- 229,300 miles (369,000 km) -- that it can't even be seen in this view. Venus is in the middle distance, 75 million miles (121 million km) away. Mars is more than twice that far. Note that there's an interesting optical illusion gong on in this bird's eye view. Because of the orbital lines, the eye is fooled into thinking that the earth, Venus, and Mars don't line up. Put a ruler on this image and you'll see that they really are in a straight line! Suppose you sleep in and miss this conjunction. All is not lost. If you look at around 10 a.m., and you have sharp eyes and some patience, you can still find Venus close to the moon. At 10 a.m. the moon will be riding high in the southern sky close to the meridian (the imaginary north-south line in the sky from due north on horizon, through the zenith overhead, to due south on the horizon). You should be able to spot it with your naked eyes if you know where to look, certainly with binoculars. Here's how: Look about seven degrees (a binocular field) south of the moon, and you might spot a tiny speck of light in the blue sky: the planet Venus. You can use this trick every month to spot Venus in the full daytime sky. All you need to do is find out the date when the moon and Venus are in conjunction; Starry Night will tell you this. Unfortunately, Mars is too faint at present to punch through the blue of the sky to be visible.